Oh Em Gee. It's been so so long since I appeared alive on this blog. Makes me kind of want to keep myself hidden, I feel so ashamed that I abandoned this love child of mine for such a long time. 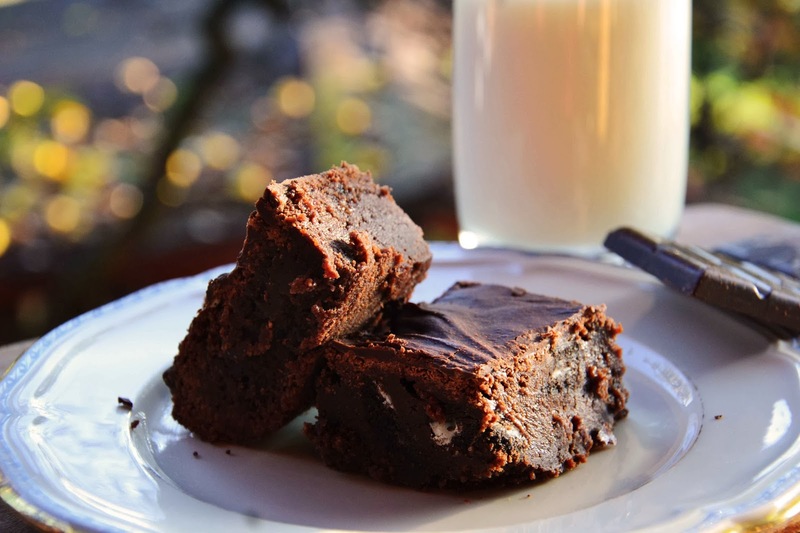 These brownies are seriously extraordinary, finger-lickingly good! And I'm saying this without being biased. Imagine a piece of fresh and still warm brownies with a scoop of vanilla ice cream. The top is slightly cracked (really, only slightly), the inside is heavenly gooey without it being unbaked, sweet but not overly sweet and the vanilla ice cream just brings out the intense chocolate flavour. This scenario should be familiar, right? Now, imagine this with a thin layer of chocolate ganache on top and some hidden oreo bits inside. Oh, and the best of all? The next day, it even tastes better! How could it be possible? But it is, I had the strongest urge this morning to have a small piece for breakfast ( hello diet!) and it was thick, totally fudge-like and utterly delicious. I altered the famous baked brownie recipe a bit (less butter, less sugar, less chocolate, more ganache, more oreos) and ended up with this brownie extraordinaire. It's so easy and quick to whip up and I highly advice you make it for a family or friends gathering since it's a big one. We were 5 for the pan and not even its half was gone. Preheat oven to 350F (175C). Grease the bottom and sides of your pan. In a bowl, combine the flour, cocoa powder and salt together. Melt the chocolate, butter and coffee in a bowl over a pan of simmering water. Stir occassionally, when they're all melted, turn the heat off and add the sugars in. Stir it until the sugar is dissolved, then remove the bowl from the pan and let the mixture cool to room temperature. When the chocolate mixture has cooled, mix in 2 eggs at first, then the other 2 and vanilla. Don't overmix or your brownies will be cakey. Fold in the flour to the chocolate mixture and mix it with a rubber spatula. Drop the oreo pieces in. Pour the batter into the greased pan and bake for 25 minutes. While your brownie is baking, make the chocolate ganache. Place the chocolate and oil in a small saucepan and over low heat cook them until the chocolate is melted. Turn the heat off and add in the cream. Stir and let it cool. When the brownie is ready, let it cool to room temp and spread the ganache on top. Hahhaha but sooo worth it! ;) There's always time for salad after a piece of this gooey heaven! Wow! I'm super picky about the consistency of my brownies (if I wanted chocolate cake, I'd make one), and these look perfect. These look amazing! Going to have to try them soon. I think the ganache is a perfect topping for brownies. OMG!! Another AMAZING recipe you have posted!!! I love to look at your blog everyday for your recipes. I am making alot of them for Thanksgiving and Christmas including these for dessert!! Hello! I have been using this recipe for years now and I love it. My question is if there is a printer friendly version of this recipe? Thanks for sharing this awesome recipe with us. WifiKill APK is basically a wifi network controller app. It can disable the internet connection of other devices connected to the same wifi network.